For the first time in history scientists have descended 650ft into the magma chamber of a volcano. 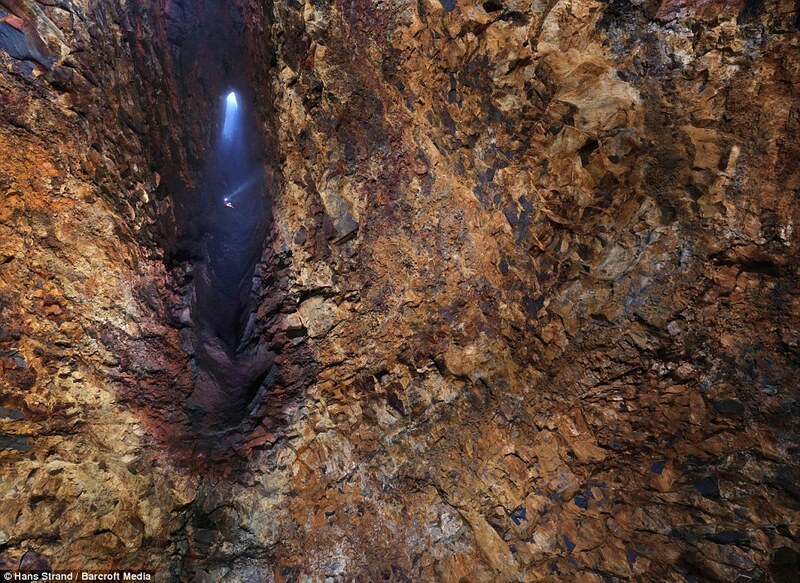 These incredible images show one explorer gently lowering himself into the heart of the dormant Thrihnukagigur volcano in Iceland. 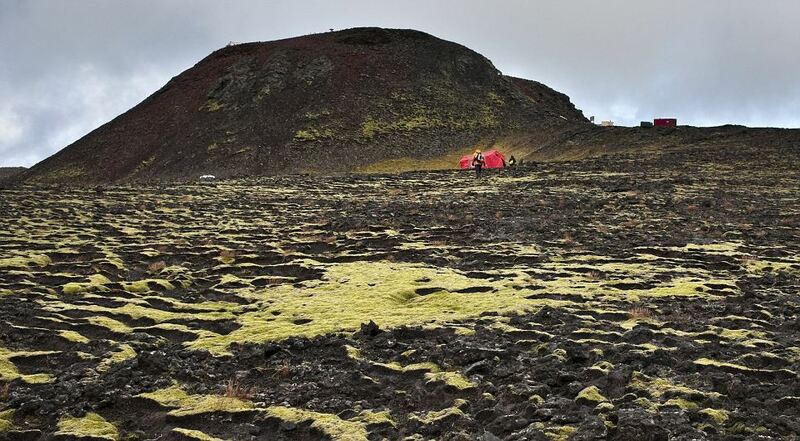 Known as a 'sleeping volcano' because it could come back to life at any time, Thrihnukagigur is credited with helping to create the Atlantic island we call Iceland when it last erupted 3,000 years ago. Only now - 50 years since the first man went into space - have human beings visited the only magma chamber on the planet currently safe to explore. Last March Eyjafjallajokull caused global chaos when it erupted, grounding aeroplanes and leaving hundreds of thousands of people stranded. 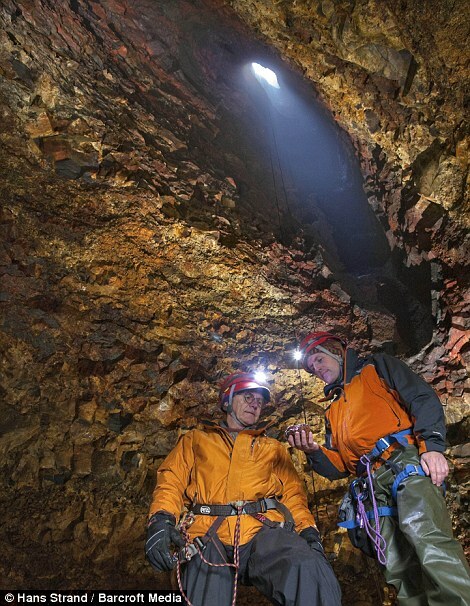 Dr Sigmundsson described the feeling of being the first scientist to witness a magma chamber from the inside - which was tinged an eerie red thanks to the rusted iron ore that lined the chamber walls. 'I felt small compared to the forces of nature,' he said. 'I was deeply touched by the beauty and tranquillity of the volcano interior. 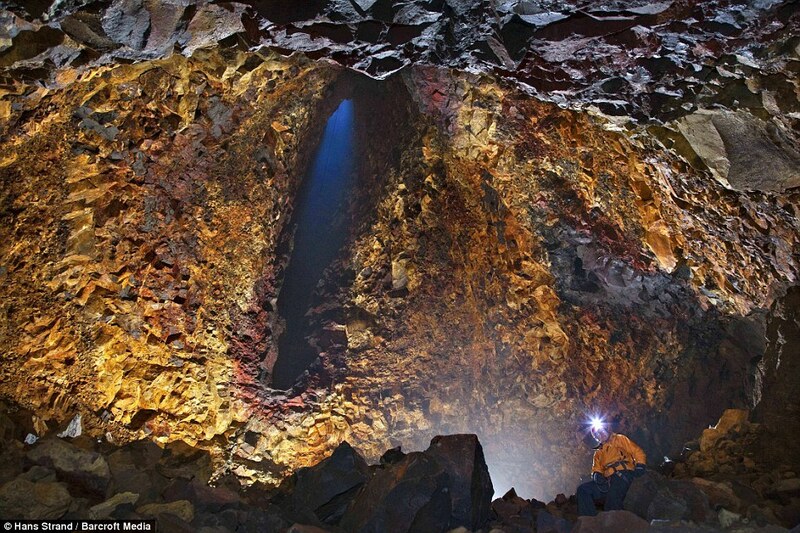 Despite the otherworldly nature of their previously unexplored underground destination, Dr Sigmundsson's team only had to travel 60 miles from Iceland's capital city, Reykjavik. The team were made up of two scientists and 15 support staff, including expert mountaineers accompanied by a film crew and a photographer to document the historic event. While people have ventured inside the relatively shallow volcanic craters located close to Earth's surface, the expedition team was the first to explore a volcano's deeper chambers in October last year. After the exploration team descended using traditional climbing equipment such as ropes and metal anchors before a metal lift was built to transport heavy scientific and recording equipment. By physically visiting a magma chamber the scientists were able to learn valuable lessons about the inside of natures most destructive but important forces. 'The plumbing system of volcanoes is complicated,' he said. 'We could observe a weak layer of rock, that may have eroded easily helping with the creation of the volume that filled with magma during the last eruption. 'This magma then drained out and created an "open part" of the magma plumbing system we could explore. 'These channels were on the order of two to six foot wide.